It’s somewhat alarming to think about how many things I forget during the course of a normal day. The exact number eludes me; I forget how many things I’ve forgotten. There are little things like forgetting where I’ve put my keys and wallet, and also big things like where I’ve put my children. I’ve forgotten appointments, to eat, to set my alarm, and, I noticed today, the fact that the oil needs to be changed in my truck. I thought about that and had to agree that what she said was at least partly right. I wasn’t sure if it were possible to have so much in my head that nothing else could get in, but I did have a lot of seemingly useless stuff stuck in there. Stuff like the fact that a dragonfly can eat its own weight in thirty minutes. Or that Hollywood was founded by a man who wanted to build a community based on his conservative religious principles. Couvade is a custom in which a father simulates the symptoms of childbirth. Einstein went his entire life without ever wearing a pair of socks. I could go on. Where I’ve managed to scrape up such tidbits of uselessness is beyond me. So is the manner by which I can remember that John Milton went blind because he read too late at night but not the name of someone I see at work every day. The fact that I may simply be absent-minded occurred to me. It’s a distinct possibility. I come from a long line of absent-minded people. But that seems like a poor excuse in itself, and I keep thinking about what my mother said to me. There’s little doubt that we all fill our lives with things that don’t matter, thereby sacrificing some of the things that do. Worry robs our faith, doubt our hope, and discord our love. But is that true for knowledge? Can we know too much for our own good? Some people think so. I have friends who believe that faith is all they need, that thinking has done nothing but bring the world a whole lot of trouble. Communism, moral relativism, and Keeping up with the Kardashians wouldn’t exist if someone hadn’t thought them up and ruined all of our lives. Sometimes I think that’s true, especially with Keeping up with the Kardashians. Faith is pretty much the most important thing a person can have. I also think having as much knowledge as possible easily breaks the top three. Because despite what everyone says, ignorance is not bliss. It’s more like a prison cell with walls of our own making. Of all the inborn traits God sees fit to give us, few are exercised less than our curiosity. Spending some time with the nearest child will convince you that we’re all born with a probing mind. But that somehow gets lost as we get older. We all are tempted to reach a point where we just don’t care to know anything else. We already know enough about the world to realize it’s all spiraling downward. Why pile it on? I get that, I really do. There are plenty of things I would rather not know, things that would keep my life chugging along rather nicely if they weren’t stuck on one giant playback loop in my brain. But then there’s this to consider—our world really is a wonderful place. Flawed, yes. And a bit ugly in some places. But it’s also amazing and inspiring and so utterly almost-perfect. The truth? I want to know everything. Even the stupid stuff. After all these years, I’m still curious. I still want to know. Because I’ve found that the more I can know about God’s world and the people who inhabit it, the more I can know about God and me. If that keeps me from checking my mail every once in a while or not realizing the truck’s almost out of gas, then so be it. I think we would all be a little better off if we cracked a book every once in a while. There’s too much ignorance in this world. Life, like music, must contain several parts equally. There must be melody and beat. And there must be heart and head. That’s how we dance through our days. And God is a musician at heart. 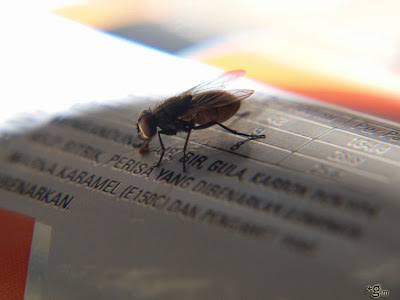 Just ask the common housefly. Whose wings, by the way, hum in the key of F.
Just read this (Jan. 2016) and, as always, you hit the nail right on the head. Or, you swatted that fly stone dead! Love your writing, and the way you think and tell stories. You can’t have too much in your head, if it’s all good.